I find myself frequently using Python's interpreter to work with databases, files, etc -- basically a lot of manual formatting of semi-structured data. I don't properly save and clean up the useful bits as often as I would like. Is there a way to save my input into the shell (db connections, variable assignments, little for loops and bits of logic) -- some history of the interactive session? If I use something like script I get too much stdout noise. I don't really need to pickle all the objects -- though if there is a solution that does that, it would be OK. Ideally I would just be left with a script that ran as the one I created interactively, and I could just delete the bits I didn't need. Is there a package that does this, or a DIY approach? reinteract -- very impressive, I want to learn more about visualization and this seems like it will shine there. Sort of a gtk/gnome desktop app that renders graphs inline. Imagine a hybrid shell + graphing calculator + mini eclipse. Source distribution here: http://www.reinteract.org/trac/wiki/GettingIt . Built fine on Ubuntu, integrates into gnome desktop, Windows and Mac installers too. bpython -- extremely cool, lots of nice features, autocomplete(! ), rewind, one keystroke save to file, indentation, well done. Python source distribution, pulled a couple of dependencies from sourceforge. I am converted, these really fill a need between interpreter and editor. 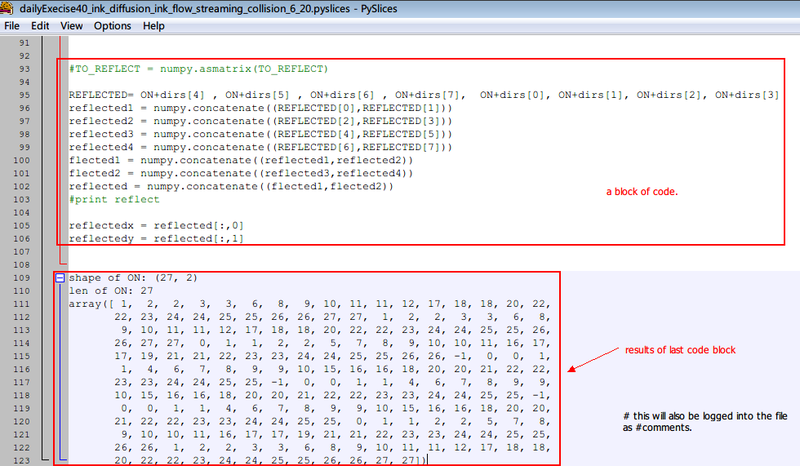 IPython is extremely useful if you like using interactive sessions. For example for your use-case there is the %save magic command, you just input %save my_useful_session 10-20 23 to save input lines 10 to 20 and 23 to my_useful_session.py (to help with this, every line is prefixed by its number). Look at the videos on the presentation page to get a quick overview of the features. # bound to the Esc key by default (you can change it - see readline docs). # to it:  "export PYTHONSTARTUP=/home/user/.pystartup" in bash. # full path to your home directory. Please note that this will only work on *nix systems. As readline is only available in Unix platform. This will create a uniquely named .py file and store your session for later use as an interactive Ipython session or for use in the script(s) of your choosing. Also, reinteract gives you a notebook-like interface to a Python session. I had to struggle to find an answer, I was very new to iPython environment. This will save all your python statements in test.py file in your current directory ( where you initiated the ipython). There is %history magic for printing and saving the input history (and optionally the output). History IPython stores both the commands you enter, and the results it produces. You can easily go through previous commands with the up- and down-arrow keys, or access your history in more sophisticated ways. You can use the %history magic function to examine past input and output. Input history from previous sessions is saved in a database, and IPython can be configured to save output history. This will take line 3 and lines 18 to 20 from the current session, and lines 1-5 from the previous session. See %history? for the Docstring and more examples. Also, be sure to explore the capabilities of %store magic for lightweight persistence of variables in IPython. Stores variables, aliases and macros in IPython’s database. %store -r d  # Refresh the variable from IPython's database. To autorestore stored variables on startup, specifyc.StoreMagic.autorestore = True in ipython_config.py. It has History log and Variable explorer. If you have worked with MatLab, then you'll see the similarities. As far as Linux goes, one can use script command to record the whole session. It is part of util-linux package so should be on most Linux systems . You can create and alias or function that will call script -c python and that will be saved to a typescript file. For instance, here's a reprint of one such file. Small disadvantage here is that the script records everything , even line-feeds, whenever you hit backspaces , etc. So you may want to use col to clean up the output (see this post on Unix&Linux Stackexchange) . there is another option --- pyslice. 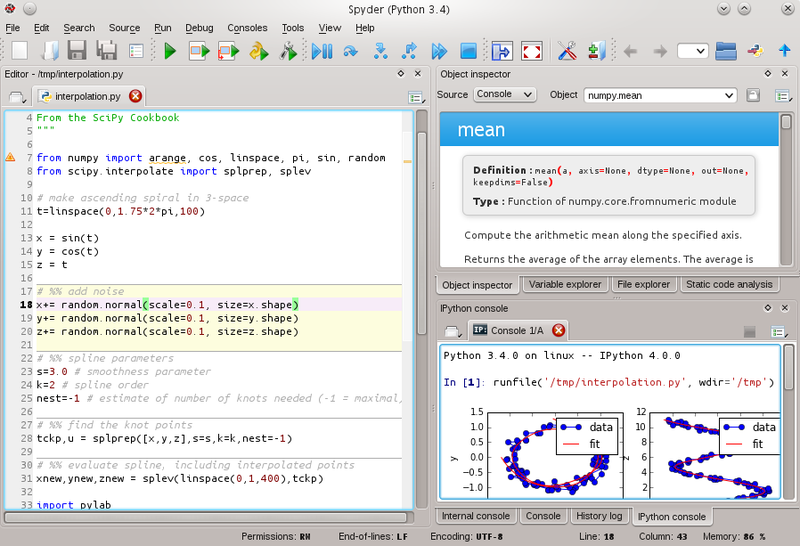 in the "wxpython 2.8 docs demos and tools", there is a open source program named "pyslices". you can use it like a editor, and it also support using like a console ---- executing each line like a interactive interpreter with immediate echo. of course, all the blocks of codes and results of each block will be recorded into a txt file automatically. the results are logged just behind the corresponding block of code. very convenient. The %history command is awesome, but unfortunately it won't let you save things that were %paste 'd into the sesh. To do that I think you have to do %logstart at the beginning (although I haven't confirmed this works). which will save the output, line numbers, and '>>>' before each input (o, n, and p options). See the docs for %history here. The -f option is used for forcing file replacement and the len(IN)-1 shows the current input prompt in IPython, allowing you to save the whole session programmatically. I'd like to suggest another way to maintain python session through tmux on linux. you run tmux, attach your self to the session you opened (if not attached after opening it directly). execute python and do whatever you are doing on it. then detach from session. detaching from a tmux session does not close the session. the session remains open. cons of this method: this method does not relinquish the resources used by the opened python session until you actually exist the python interpreter. If you use bpython, all your command history is by default saved to ~/.pythonhist. Then edit that file to clean it up and put it under Python path (global or virtual environment's site-packages, current directory, mentioning in *.pth, or some other way). I find this saves the input and output, going all the way back to when I opened the terminal. This is not ipython specific, and would work with ssh sessions or other tasks run from the terminal window. Not the answer you're looking for? Browse other questions tagged python shell read-eval-print-loop interactive-session or ask your own question. How can I save the code written in an IPython session? Can I redirect my python/ipython input/output to a text file? Where is my output in python? Save session in IPython like in MATLAB?